Company Profile | Skarda Equipment Company, Inc.
Today, Skarda Equipment is known as a regional distributor of pneumatic, hydraulic and electrical control equipment. Our primary focus is on a 4-state area of Iowa, Kansas, Missouri and Nebraska, although our customer's influence stretches nationally and internationally. The company was started in 1969 and has continued to be a family-owned business. John and Darlene founded the company in the basement of their home with inventory piled on top of the washer, dryer, and water heater. As John made sales calls, Darlene typed in invoices and deposited checks. The company has now grown to fifty employees and 35,000 sq. ft. of office space. Skarda is also now present in a four state area. However, the core family values that started this company still continue to be a major factor in how Skarda operates today. John and Darlene realized their dream of opening their own business. The company began out of their home on Margo St. in Omaha and was committed to providing the best quality pneumatic products to their customers. John Skarda signed his first order at Armstrong Rubber in Des Moines. This was an order for a $20 Wilkerson air filter. The sales the first year were $150,000.00, reflecting the faith John's customers had in their new venture. The first product lines were Foster, Humphrey, Hydroline, and Wilkerson. Skarda has continued to maintain their relationships with these early partners. Getting the company started came with a price, this price was selling Darlene's $600 vehicle in order to purchase Wilkerson and Humphrey inventory! With ten employees, Skarda Equipment has outgrown the Skarda residence. They moved into S. 22nd St. office in 1974. Within a few years, they had outgrown the building and significantly increased square footage with a steel addition. During the 70s, we also added branches in Kansas City and Cedar Rapids, Iowa. Skarda was an early adopter of computer technology. The company kept inventory and accounting records, and processed sales on a computer starting in 1979. Pictured above is Dorothy Bos who is typing in invoices into the "Brand new" Data General Nova 3 computer! By the mid 70s, sales were exceeding half a million dollars annually. The product lines had expanded to include Advanced Automation, Tolomatic, and Skinner Fluid Control Valves. The company remained committed to stocking the warehouse with the components needed to keep their customer base running. 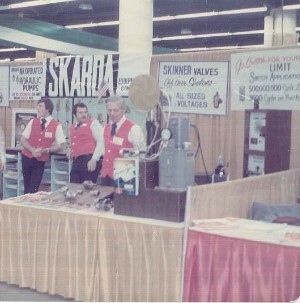 In 1972, Skarda began demonstrating cylinders at Product Shows. The Skarda team enjoyed using popcorn or peanuts in their demonstration of a product. By 1982, with over 40 employees, Skarda once again moved to a new building. The new building had almost 35,000 square feet-plenty of room for inventory and employees. The man on the left, Gary Skogheim, was promoted to the newly created position of Executive Vice President December 29,1987. Gary would later become President of Skarda. With so many employees, and a larger building, the Skarda's began the tradition of an annual holiday party for everyone to socialize and celebrate jobs well done. The first few parties were hosted at the Richfield Café, a cornerstone in the little known community of Richfield, Nebraska. In the 80s, sales grew exponentially and were close to 4 million annually. Skarda added key manufacturers such as Gast, Deublin, and Nichols Motors during this decade. John Jr. joined the Skarda staff on a permanent basis in 1992, initially working in the IT department before advancing to Vice President. Technically he had been on the payroll since 1983 when he started helping with the computers while still in high school. John doesn't remember ever NOT working for Skarda. In 1997, Skarda celebrated a major Humphrey sales goal. The relationship between Skarda and Humphrey began in 1969 (when Skarda began) and continues today. The celebration was held at the Renaissance Mansion and a special sales award was given to John and Darlene Skarda. In 1998, Skarda had 19 employees who were Certified Fluid Power Specialists - our outside sales team was 100% certified. To this day, Skarda is committed to keeping all outside sales personnel and executive management fluid power certified. Skarda is dedicated to the IFPS membership, also. Our VP of Sales, Lynn Nordquist, will serve as Director-at-Large on the IFPS Board, 2017 - 2018. Lynn Nordquist first started at Skarda in 1988 in outside sales for Wichita. On October 1, 2004, Lynn was promoted to Vice President of Sales and moved to the Omaha office. Although Lynn spends most of his time training other salesmen and handling management responsibilities, some customers will always call Lynn first. In his own words "My customers know they can count on me." During the Fall of 2005, Skarda teamed up with Kansas State University's Robotic Competition Team. The team used 80/20 to build a lighter, larger, and sturdier arena to better host the competitions. President John Skarda Jr. (Alumni of Kansas State) met up with the team members that were building the arena and observed some of the bots there. He appreciated the fact that the Skarda name and 80/20 products were reaching the next generation of engineers. By the time the arena was completed, it was able to hold more tournaments and larger bots! CMDI (Control Motion Dynamics Inc.) was created as a sister company to Skarda in 2001. CMDI's main purpose is to better assist their customers in their design needs all the way to start-up. When the company began, we were unaware of the global impact CMDI would have. As of today, CMDI design projects are active around the globe, in places such as Russia and China. Pictured above is former CMDI operations manager, Floyd, in Belegorod, Russia. Every year in July, all of Skarda's territory managers gather at Radar Lodge to "discuss the sales plan" at the annual Kansas Sales Meeting. Thanks Radar Lodge for getting these guys out of our hair for a few days! During the Fall of 2010, Skarda became a distributer of the Clippard Product Line. Clippard has provided quality pneumatic valves, fittings, and cylinders in the Midwest since 1941. Skarda continues to be a major distributor of Clippards Products. Skarda was one of the first distributors to switch to a computer based order system in the 70s. Keeping up with technology, Skarda launched our new e-commerce site in 2015, allowing customers to order products online 24/7! Skarda began as an extremely small business started in John and Darlene's basement. However, in that basement the core values of Skarda were solidified. "Family-owned" continues to be an important aspect of how Skarda operates today. The customer service that was provided by the family working from their basement is still found at the office on Farnam St. today. We were here yesterday, we are here today, and we will be here tomorrow for all your automation and motion control needs.